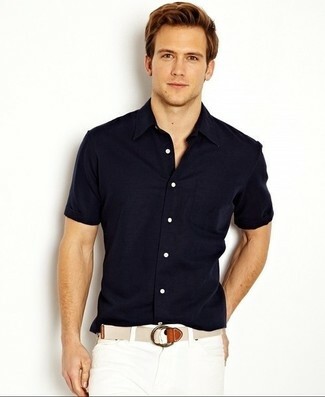 If you're looking for a casual yet seriously stylish outfit, wear a navy short sleeve shirt with navy jeans. As well as super comfortable, both of these pieces look stunning together. To add elegance to your getup, round off with black leather casual boots. 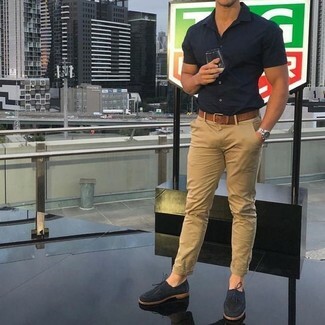 If you're hunting for a casual yet dapper look, opt for a Thom Browne chest pocket shortsleeved shirt and brown chinos. Both garments are very comfy and will look great paired together. Spruce up your getup with black leather casual boots. If you're scouting for a casual yet seriously stylish getup, pair a Thom Browne chest pocket shortsleeved shirt with khaki chinos. These two items are super comfy and will look incredible when worn together. Bump up the cool of your ensemble by wearing navy suede derby shoes. 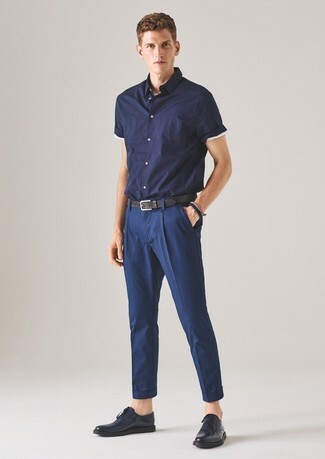 Wear a navy short sleeve shirt with navy dress pants for a classic and refined silhouette. 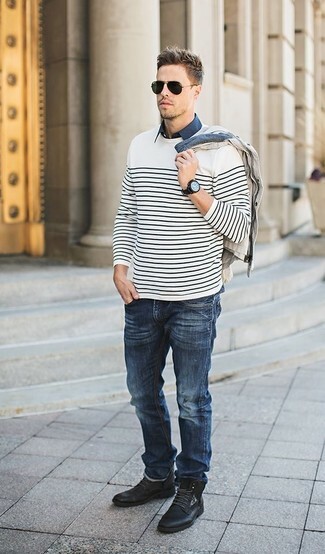 Round off with navy leather derby shoes and off you go looking awesome. If you're on the lookout for a casual yet seriously stylish ensemble, dress in a Thom Browne chest pocket shortsleeved shirt and white shorts. Both of these garments are totally comfortable and will look incredible when worn together. If you're on a mission for a casual yet seriously stylish outfit, opt for a Thom Browne chest pocket shortsleeved shirt and grey chinos. Both of these pieces are totally comfy and will look great when paired together. 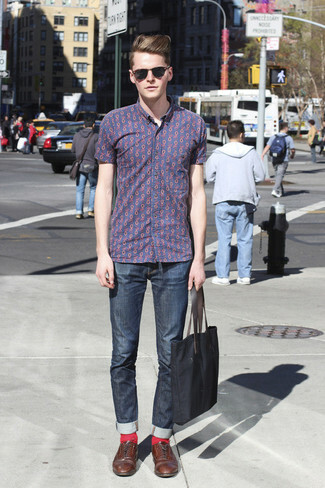 When it comes to shoes, this ensemble is complemented nicely with white leather low top sneakers. 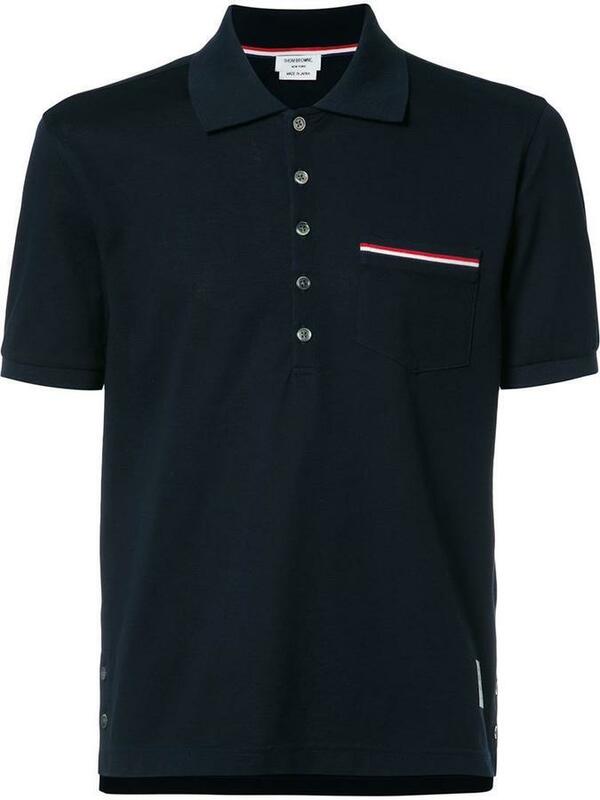 If you're searching for a casual yet sharp ensemble, wear a Thom Browne chest pocket shortsleeved shirt with navy jeans. As well as totally comfy, these two garments look fabulous together. Rocking a pair of brown leather brogues is a simple way to add some flair to your outfit. If you're scouting for a casual yet seriously stylish getup, opt for a navy short sleeve shirt and red shorts. These two garments are totally comfy and they will also look wonderful when worn together. This outfit is complemented perfectly with green suede driving shoes. 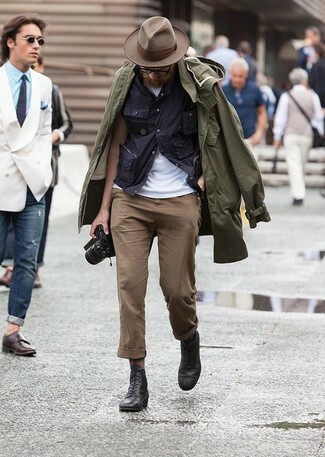 If you're hunting for a casual yet sharp look, marry a Thom Browne chest pocket shortsleeved shirt with beige chinos. As well as super comfortable, these items look incredible together.